Last night my husband asked me if I could bake some sweet muffins. I haven't baked any muffins or cakes since I started my low calorie diet three months ago (with the exception of Happy Herbivore's amazing low fat Black Bean Brownies). Before my diet I used to bake muffins, brownies, cakes, pies, etc at least once or twice a week. I often used 1 cup of sugar and up to 1/2 cup oil in my recipes making the baked goodies into calorie bombs. This recipe represented a new challenge for me. To make a healthier muffin that would be lower fat, lower sugar, lower calorie, but still tasty and sweet enough for my husband to enjoy. The average muffins have around 400 calories a piece. This muffin is around 122 calories :-) For some reason it only made 9 muffins, but if you have smaller muffin pan you might be able to get 12 muffins out of this and lower the calories per muffin. Maybe adding more water would help to stretch the batter a bit. I usually use apple sauce but here I decided to use something else. You can use unsweetened applesauce. You can use more stevia instead of raw sugar, or add more sugar instead of stevia if you don't mind the extra calories. I topped my husband's muffins with dark chocolate peanut butter frosting and mine with a tiny spoonful of apricot jam. Raspberry jam or cherry jam would probably be a better option, just make sure you get low sugar jam with about 30 calories per tablespoon. Or eat the muffins with a cup of tea, or hot almond milk. Preheat oven to 400 F. Line muffin cups with muffin liners. Mix all dry ingredients in a large bowl. Combine all wet ingredients in medium bowl. Stir the wet ingredients into dry mixture. Fill muffin cups to the top with batter. Bake 20 minutes, or until a toothpick inserted into the center of a muffin comes out clean. Enjoy! Dieting is SO depressing, especially when your husband is not dieting...should he be, but isn't? 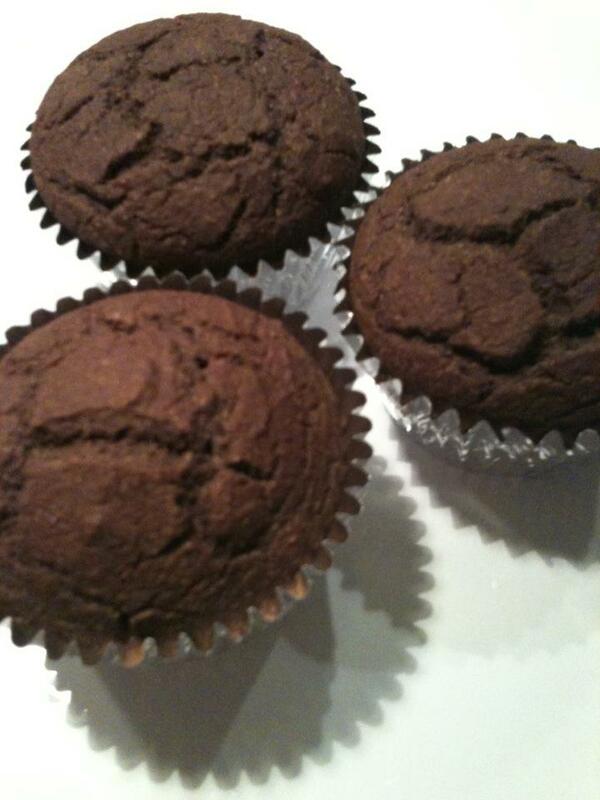 ;-) Anyway, these muffins are lovely! Oh - this recipe looks amazing. It's definitely on my must-try list.